Capsule Summary: The 4077th grapples with lack of fruit, toilet paper, winter clothing, and other necessities after supply lines are cut. 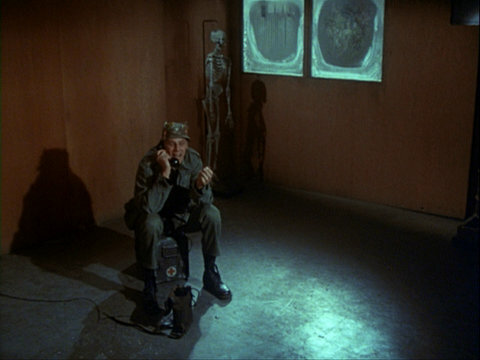 This episode may very well have the best last line of any episode of M*A*S*H. Henry, sitting alone in his office, which has been stripped bare, tells someone on the phone, “I’m talking to you from deep inside a real big empty.” The way McLean Stevenson emphasizes the word “real” is just hilarious. It’s interesting how little actually takes place during this episode. There’s no real plot, just the story of the 4077th facing a crisis. We see most of the characters dealing with their assigned duties. Frank is in charge of conservation, distribution, and possible rationing of food. He berates Klinger and Father Mulcahy for wasting coffee means playing bingo. Later, he “requisitions” a baked ham to share with Margaret. In other words, he stole it, and it doesn’t seem to bother him at all. At least he takes responsibility for his actions. Hawkeye and Trapper graciously offer to keep their mouths shut about Frank’s transgression. Trapper is in charge of heat and electrical power. He burns Radar’s clipboard, orders Margaret to get rid of her hot plate, and allows 30 minutes of radio use at night in the Swamp. Radar is housing officer and takes his job seriously. Margaret is responsible for looking after her nurses, who impress her by acting in the Yankee Doodlest manner. Father Mulcahy is in charge of morale, which means bingo and songs. That just leaves Hawkeye. He’s in charge of maintenance and general service and supplies but we never see him doing anything other than cracking jokes. The running gag about Henry’s desk getting smaller and smaller as people cut it apart for firewood is amusing. That said, I find it hard to believe anyone would actually do something like that. Frank confronts two corpsman, played by Jeff Maxwell and Dennis Troy, who are burning desk drawers presumably taken from Henry’s desk. -Uninhibited nurse interested in Nietzsche, Freud, Beethoven and pre-Columbian art, will spend evening with anybody with five pieces of wood. -Hungry? Cold? Tired of it all? Come to tent nine, change into something comfy, put on mask and wait. No appointment necessary. Hawkeye: “Oh, you scoff. They laughed at Orville Wright when he invented his brother Wilbur. They said he would never get him off the ground. I also like the hunting socks bit. Henry returns from the latrine to find Hawkeye and Trapper wrestling with Frank. “They’re hunting socks, sir,” Radar explains. “At this hour?” Henry asks. We (Marks) and I had a particularly good time writing this one. Sometimes you get on a roll and I think we had a pretty good one going throughout the second season (given the odd clinker here and there). > Any comments on anything about this episode Elsig? Only to say that it was one of those scripts that was just a joy to develop, to write and to help come to life. The final (uncut) result, l think is a testament to how much fun we had making it. Seven nurses are seen in Margaret’s tent–plus Margaret herself and, of course, Klinger. I recognize Kellye Nakahara, Gwen Farrell, and Sheila Lauritsen (I think). Why is Father Mulcahy singing in front of a microphone in the Mess Tent? Is his performance going out over the PA system? Whatever happened to Hawkeye’s pair of longjohns, the ones passed around the camp in “The Longjohn Flap” from Season 1? When Hawkeye grabs the satchel with the baked ham off Margaret’s desk, Trapper brandishes the flashlight attached to his clipboard as a gun, pointing it at Frank, who actually seems scared. One of my favorites of the entire series. I could watch it everyday. Just so many great lines from an episode that features the entire ensemble. The Swamp scenes are complete hilarity — from Henry’s frequent bathroom visits and snoring to Father Mulcahy’s unusual version of ‘now I lay me down to sleep’. My favorite scene throughout is perhaps everybody taking so long to nestle down into the Swamp for the night, then when they finally do, bang, casualties arriving. KLINGER: Father, it’s awfully cold out there. Want my stole? MULCAHY: Oh, why thank you, my son! How about Henry announcing that you don’t want to leave your brass monkeys out tonight ? One of my favourites. ‘That does it…how are we supposed to fight a war without shuttlecocks? I always liked the “my sister sent it to me.” line when Frank asks Igor where he got the wood. The fact that Frank believes it is the icing on the cake. So many funny lines in this episode, It’s hard to single out just one, but I’ll try. Hawkeye: Damn the staples, man. This is war, everyone’s got to live dangerously. The exchange of secret knocks between Frank and Margaret comes across as very childish and is emblematic of their idiotic attitudes in general. Is the scene referenced above about Trapper ordering HotLips to get rid of her hot plate cut in syndication? I don’t recall it. It was cut in syndication along with several other scenes. Hawk accusing Frank of doing “a little Valley Forge gorging” is emblematic of the writing on the show. Father Mulcahy: Now I lay me down to sleep, a bag of peanuts at my feet. If I should die before I wake, give them to my brother Jake. A humorous line in an episode full of them.